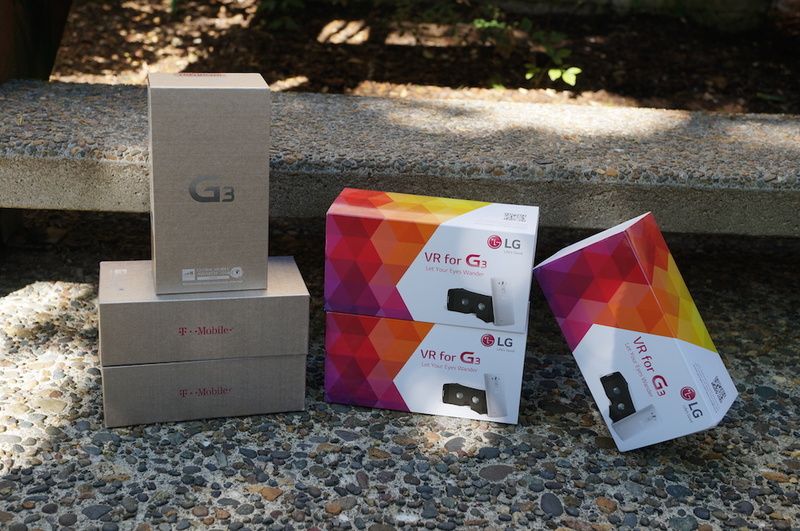 To help spread awareness for LG’s VR for G3 headsets, we have in our possession three, count ’em 1, 2, 3 LG G3 headsets to give away. Each is for T-Mobile’s network, so if you are already on T-Mobile or plan on switching to the Uncarrier, these will be a nice little prize for you. With VR for G3, which is based off of Google Cardboard, G3 owners can experience a somewhat basic virtual reality, complete with games and apps, all of which are available directly from Google Play. The VR for G3 is available directly from LG when you purchase a new G3 and select retailers, plus LG couples a QR code on the box where you can grab a few exclusive VR titles for your enjoyment. So, if you are interested in winning, let’s get to it. Update: We have our three winners! Congrats to Casey B, Brett E, and Jason E! Please check your emails and spam folders. Thanks to everyone who entered. Win 1 of 3 (Three) LG G3 units on T-Mobile. We have 2 in Silk White and 1 in Metallic Black. Please state which color you would prefer in the comments below, but be aware, we have a limited supply. Three winners will be selected randomly at 10am on Tuesday (4/21) morning.